In WebCenter Portal, you can define the URL parameter name/value pair in the URL parameters section in the Navigation Model. When you do that, the name/value pair will be added to the URL as a query string, such as "?name=value". As the header suggests, the URL parameter in the Navigation Model of WebCenter Portal application cannot be a NULL object. If the URL parameter is a static value, then it's not a concern. In case there is a need to dynamically populate the URL parameter in the navigation model, it's important to make sure the dynamical value cannot be NULL object. Because when the value is NULL, the navigation model does NOT know how to construct the query string. Note the NULL object is not equivalent to empty string. 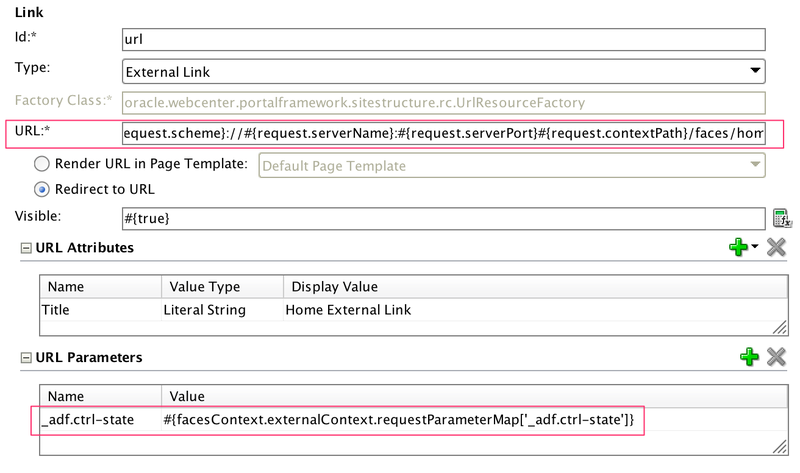 In this case, WebCenter Portal will not able to recognize the requested URL. In such case, it will redirect to the application context root which will induce the index page or whatever page you have define as the default page to render. To work around it, simply return an empty string if the dynamic value could be null in your logic.